"Avatar Aang accomplished many remarkable things in his life. But sadly, his time in the world came to an end, and like the cycle of the seasons, the cycle of the Avatar began anew..."
The Legend of Korra note Avatar: The Legend of Korra outside of The United States. is an animated series from Nickelodeon and a Sequel Series to Avatar: The Last Airbender and part of the overall Avatar franchise, as well as the 30th cartoon in the Nicktoons franchise. It ran from April 14, 2012 to December 19, 2014. Set seventy years after the events of its predecessor, the series follows the adventures of a boisterous teenage girl named Korra, a member of the Southern Water Tribe and Aang's successor as Avatar. Thematically, there are some differences between it and the parent show: while Avatar: The Last Airbender is arguably High Fantasy with East Asian elements mixed in, The Legend of Korra is Urban Fantasy in an East Asian setting, complete with mass media and politics. In a deviation from its predecessor, each book focuses on a new antagonist for the arc rather than one single Big Bad, as a way to place more emphasis on the Avatar's role as the world's protector. While it was originally announced as a twelve episode Mini Series, Nickelodeon picked up an additional fourteen episodes during production. After the success of the first twelve episodes, another 26 episode season was announced. These were later broken up into three seasons, fourteen episodes for the second and thirteen each for the third and fourth. Book 1: "Air", begins with Korra having easily mastered all the elements but air. When told that her training will have to wait due to political concerns, Korra travels to Republic City - a metropolis based off of The Roaring '20s, where crime is rampant and an anti-bending movement, led by a faction called the "Equalists", is growing in strength. Under the guidance of Tenzin, the son of Aang and Katara, Korra struggles to learn airbending while balancing her status and responsibilities as the famed Avatar of legend. Book 2: "Spirits", began September 13, 2013. Rampant spirit attacks on humans force Korra to confront her role as the bridge between humans and spirits head-on, in the process embroiling her in a conflict 10,000 years in the making. Book 3: "Change", began airing on June 27, 2014. It deals with a great change in the bender population, Korra having to face the consequences of her actions at the end of Book 2, and a prison break of four powerful criminals with sights on Korra, all while political unrest grows in Ba Sing Se. After airing two episodes a week for the first three weeks (and one episode the fourth), it was taken off the air and moved to a digital-distribution-only schedule on Nick's website. The remaining episodes were eventually aired on Nicktoons as part of a marathon leading up to the online release of Book 4. Book 4: "Balance", premiered on October 3, 2014, remaining in digital distribution, with the television debut on Nicktoons on November 28. Three years have passed, and the world is once again threatened by the rise of an army led by Zaofu metalbender Kuvira. It is the final Book of the series. A downloadable action game based on the series, made by PlatinumGames, has been released. There is a three episode web animation, Republic City Hustle, about the lives of Mako and Bolin three years prior to the series. The series likewise joined TeenNick in October 2014 along with running on NickToons. As with its predecessor, continuations are being published by Dark Horse Comics. Unlike The Last Airbender comics, they are directly written by Michael Dante DiMartino, with Bryan Konietzko supervising art and helping with story. 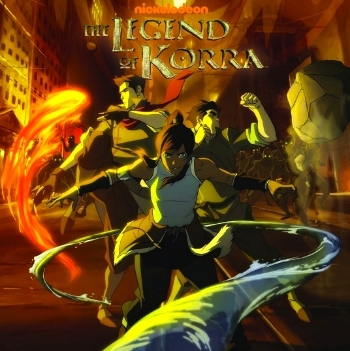 The first trilogy, called Turf Wars, focuses on Korra and Asami's relationship and the repercussions of the series finale. The main artist of the comic is Irene Koh, with Jane Bak providing colours and Heather Campbell on covers. The second trilogy, titled Ruins of the Empire, will focus on rebuilding the Earth Kingdom in the wake of the events of Book Four. The main artist is Michelle Wong. Recaps of the show can be found here. Also has a page for memes, ship tease, and a Best Episode Crowner .